The story of dirt track racing at the Wimborne Road raceway from its inauguration to the present day. FORMER Leicester team manager Glyn Taylor has been digging up Pirates’ track – and is hoping falling temperatures during the current freezing spell do not scupper his hard graft. 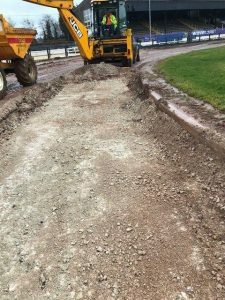 The 64-year-old Australian, who designed and built Somerset and Redcar’s circuits and is renowned as an expert in his field, spent more than a week working at Wimborne Road. Among a string of changes, Taylor carried out extensive upheaval to bends one and two, moved the start line back six metres and added more camber to the corners. 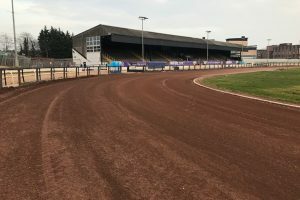 The work was carried out following consultation with Chris Holder, and the Pirates star and his team-mates are due to test out the track with a behind-closed-doors practice session next month. “Each time you put a new layer on, you roller it in and then compact it. We left it for a week and then on Wednesday last week, we put on 30 tons of material which we call base – a blended mixture of clay, shale and limestone – and graded it all up.” “Then, we pulled the old track surface over the top and did all the levels and everything was looking rosy. The big problem we have now is the weather, because it’s damp. Frost can get into the newly-laid shale and what happens then is it lifts and separates and then we are back to square one.We have left it to settle and we will see what the weather does.” Oldham-based Taylor represented a string of British clubs during his racing career including Sheffield, Bradford and Newcastle, while his father Chum rode for Poole in 1964. Pirates boss Matt Ford said: “Glyn has done a great job and I’m excited, as I’m sure the fans are, to see the difference. “Glyn would like to be involved more full-time with the club but at the moment I can’t say if that’s going to happen. Polish international star who joined Poole a few weeks from the end of the 2000 season and did enough to earn a recall for the following year. A stylish racer, he proved an enigma, starting his second term with a bang, then quickly losing his form before turning his season around with a series of good scores during the summer. Finished the season on a high, helping the Pirates to win the BSPA Craven Shield and finish Elite League runners-up. His 2002 season was wrecked by injury, sustaining a broken ankle in April which sidelined him until the end of May. Showed he was still capable of scoring big points on his track comeback, but then suffered a career threatening thigh injury which brought his season to an early end. 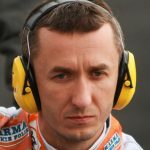 By now a seasoned star of the Grand Prix series and a member of Poland’s 2005 World Cup winning squad, Greg was back in the Poole colours for 2006 and enjoyed an injury free campaign, improving his league average by over a point and a half. He finished the year in some style helping the Pirates to win a third BSPA Craven Shield. Sadly this was to be his last season in this country, preferring just to race in Sweden and Poland, which was a great loss to both Poole and his many fans.